Looking for great organic food in Menlo Park? If you live on the Peninsula and have yet to dine at Flea Street Café, you are in for a treat. Warm earthen colors set the tone and white linen table-clothes dot the room in this simultaneously elegant, approachable, and cozy restaurant. Known for its first-rate service, inventive cuisine and organic food, Flea Street Café is a Menlo Park gem and a mainstay for area business diners. The California wines and mixed spirits flow at the recycled-glass bar. For chef-owner Jesse Ziff Cool, it is all about a longstanding commitment to sustainable cuisine. At Flea Street Café, the people, ingredients, a deep respect for the environment and culinary traditions all come together in a tapestry woven of both local and global cuisines. With a 35yr dedication to, and advocacy for sustainable agriculture, Cool’s passion for fresh, local, organic ingredients extends far beyond the kitchen, to the farmers themselves. To her, it’s the farmers who are the real heroes, and original environmental pioneers. Over 30 years ago, when Jesse opened her first organic restaurant, they said sustainability couldn’t be done. Her three current restaurants, catering company, and seven cookbooks say otherwise! It’s thanks to her that we now see that Sustainable Cuisine is more than just an idea that’s “good for the earth,” it is in fact workable business model. Cool’s restaurants continue to earn recognition, including the Zagat Award for Excellence, and awards for environmental achievement, business sustainability and community service. The bottom line… Sustainability Works! Jesse Ziff Cool is sought after as a keynote speaker, teacher, presenter and spokesperson, and has been featured on the Food Network, Discovery Channel, PBS and The Today Show, to name a few. Her cookbooks include Simply Organic, The Really, Truly, Honest-to-Goodness One-Pot Cookbook and Your Organic Kitchen. Free time is spent in her community garden. Originally planted for her own use, the garden has grown to include a dozen or so vegetable beds, fruit trees, a greenhouse and compost heap. This wonderful open space provides a fertile environment for area children to learn, expand their senses and dig in the dirt. Flea Street Café serves only fresh, in-season, organic and local ingredients. The menu includes seasonal seafood, cheese meat and salad selections, followed by elegant entrees ranging from pasta and gnocchi to seafood, poultry and grass-fed short ribs. Mouth-watering sandwiches, signature comfort foods and decadent desserts round out the ever-changing menu. Photo Credit: A special thank you to Flea Street Cafe on Facebook for use their beautiful photos. 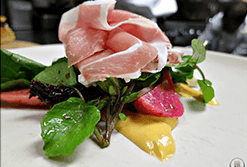 Photo 1 – Baby Beets & Prosciutto with watercress, tangerines, fromage blanc, pistachios, grilled onions and sherry vinaigrette. 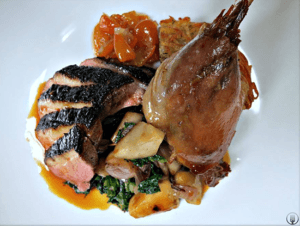 Photo 2 – Marin Sun Farms Soy Glazed Duck Breast & Duck Leg Confit over duck fat fried potatoes, mustard greens, sunchokes and kumquat compote. 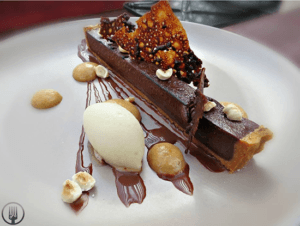 Photo 3 – Chocolate Torte with Coffee Foam, Almond Tuile and Brandy Sorbet.